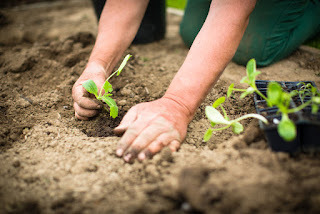 Hope Academy Rehab Blog: Get Your Hands Dirty: It’s Good for You! When a long, cold winter gives way to spring, there’s a universal joy in the air due to warmer temperatures, longer days, and sprouts of greenery. Now, scientists have identified another reason for a brighter outlook in springtime. The fresh soil that is sprouting green grass, tulips, and seedlings is filled with tiny microbes that have powerful antidepressant properties for humans. While some bacteria cause infection and disease, the bacterial microbes that are found in soil, Mycobacterium Vaccae, appear to be a “friendly” form that blocks depression. In fact, the antidepressant effect of these microbes is much like the drug Prozac, but without the side effects that can accompany the misuse of prescription antidepressants. In fact, researchers have found evidence that these microbes offer additional beneficial results like strengthening the human immune system and fighting off allergies. • Mycobacterium Vaccae strengthens and stimulates the immune system. • Immune cells release chemicals called cytokines. • The cytokines stimulate nerves, which in turn activate neurons in the brain. • These neurons release serotonin, a hormone that produces an overall sense of well-being. Avid gardeners have always known that digging in the dirt leaves you feeling happy and satisfied. Maybe it’s because of the fresh air, exercise, and healthy diet provided by the garden. Or, maybe it’s the soil microbes. For an all-around rewarding experience and natural high, try getting outdoors and joining a community garden this spring. Learning to make better choices is a key element of the young adult recovery program at Hope Academy. Our clients, ages 18-26, receive clinical treatment as well as one on one coaching in healthy nutrition, exercise, relaxation, and coping skills. Armed with this knowledge, they are able to recognize and manage their addiction triggers and cravings, and make healthier life choices. When a young adult loved one turns to self-medication instead of seeking help, they abandon their schooling, their relationships, and their dreams. Hope Academy can help them restore their futures with opportunities for college attendance, job preparation, and sober living. Let our experienced addiction counselors help your loved one get back on track. Dial 866.930.4673 to begin the rehab admissions process today.